Your own private acre! We know this house is fabulous! We vacationed on this island for ten years before we found it and we knew then we'd found the perfect place for us! Being travelers ourselves, we hate hidden fees. We never charge for additional guests. Designed for optimum tropic living, this house has vented vaults to release the warm rising air, ceiling fans and two sets of french doors to swing open during the heat of the day to allow the trade winds to blow through. There are three bedrooms, two bathrooms, a fully equipped kitchen, and an expansive wrap around porch with outdoor living, eating, a porch swing with a jungle view and even a swinging bed for your enjoyment. 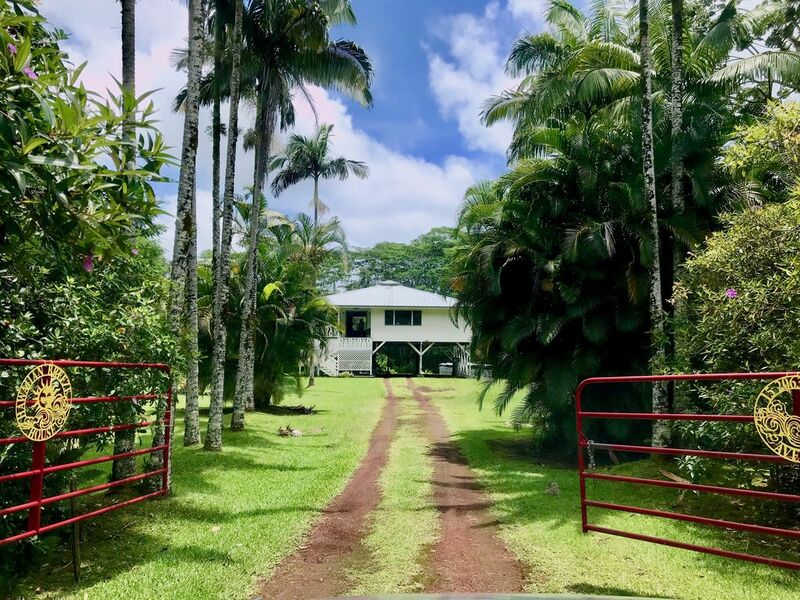 This home has all new appliances, furniture, carpet, new pillow-top mattresses, and all the comforts of home sitting on one lush acre of green grass with avocado trees and regal palms blowing in the breeze. Lots of privacy and lots of adventures to be had nearby! Located conveniently between Hilo, Volcano, and the artsy little town of Pahoa, there are so many exciting things to do. Things we never miss; swimming at Carl Smith Beach Park (swim in a white sand-bottomed lagoon and sunbathe in a park-like grassy setting), enjoying the fresh produce, jewelry and trinkets at the farmers markets (in Maku'u 5 minutes away and in another in Hilo), Visiting Volcano National Park (check ahead to see if lava is flowing! ), eating in charming Pahoa restaurants, and soaking in the local culture Wednesday evenings at Uncle Roberts Kalapana market (a great place to have dinner, listen to music, have a cocktail and watch the locals dance the hula!) We'll leave you a binder with all our favorite things to do and how to get there! Hope you enjoy it as much as we do. Much Aloha! Our family of four (with two young girls) currently resides in Anchorage, Alaska. We love the similarities between Hawaii and Alaska; the mountains, the clean oceans, the small population density, the sense of adventure and being far off the beaten path. Even though Walmart, Safeway, Target and Home Depot are just down the street, the people on this side of the island are so friendly and it is undeveloped enough we feel like we are in an exotic place! We hope to retire here. In the meantime, we plan to share it with family and friends and stay as often as possible! Located in the heart of the Puna district, there's so many exiting things to do here! Brand new ceramic top electric stovetop. Paper towels, toilet paper, hand soap and dish soap ready and waiting. Equipped for all your cooking needs and more; dishes, pots, pans, assorted glasses, coffee maker, toaster and kitchenaide mixer. A copy of the Big Island Revealed, to go to guidebook is available as well as a binder with all of our personal recommendations. One acre of green grass. 4 avocado trees, one mango, lilikoi, madarins, papayas, bananas, pineapple and coconuts are available to be picked when in season. A large covered porch wraps around the house. Nice secluded house with easy access to lots of activities. Everything you would need was there and the house felt like home. Loved the tropical bird sounds at night and watching the wild chickens in the yard in the morning. The owner provided a lot of helpful and useful information for making the most out of the experience here. We thoroughly enjoyed our stay! We loved being close to Hilo- but out of the way in our own private area. We thoroughly enjoyed eating on the deck and listening to the frogs at night. It rained on our last day- but we could still enjoy the cool air from the covered deck. Plenty of room inside and out for 3 adults and two kids! Beautiful place. So pleased, it was perfect! Nice for a family vacation. There was a little miscommunication when we arrived at the property that was however immediately solved by the owners although at the time they were aboard on business. We really appreciate the hospitality, kindness and professionalism of the owners. The entire stay was wonderful. The property is perfect for a family vacation lodging, roomy, comfy, clean and well equipped. It is convenient to get to places as well. Thanks. The first thing that struck us was the sound of nature when we arrived in the evening at Hawaiian Breeze. The frogs were singing and the stars were shining brightly. This home was perfect for our family of 4 adults.The beds were comfortable, the kitchen had everything we needed and the laundry was very convenient. The porch and living room were cozy and inviting. We enjoyed our week-long stay here, and the location was perfect for exploring the entire Big Island. Also, the hosts' recommendations were excellent--we took many of them and were very pleased with the accurate descriptions. Highly recommended. Fantastic place for a fantastic vacation! When we came from Utah we wanted to make sure we saw both sides of the island. The Hilo side was by far our favorite and we couldn't have found a better place to stay! We've stayed in many, many, many HomeAway/VRBO/AirBnB/etc. places and this one is right up at the top of our favorite list! Plenty of space for our family of 6, lots of space outside to kids to play while parents get some R&R or cook food. Location is far enough out to feel private and secluded, but close enough to do everything we wanted to around Hilo. Trena's suggestion book is amazing our favorite activity of the trip (Shipman's Beach) we pulled from her lists. Thanks, Trena for the amazing time and sharing your space with us!